Are you searching the net for Orange Beach portraits, have you stumbled onto our site and fell in love? 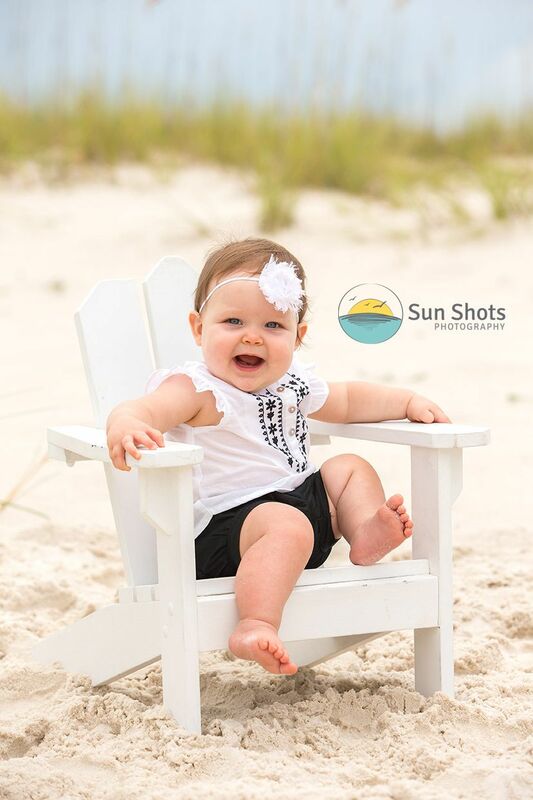 Well if so, we would love to talk to you about your very own family beach portrait session with us at Sun Shots photography. Just like the happy little cutie from last nights sunset, we would love to share our photographic art with your family. We are two skilled professionals that work together to make a record of your perfect family beach vacation in Orange Beach, Alabama. We sure did a great job of achieving that last night. This little cutie was such a ball of joy. I am almost positive her little cheeks must have been hurting by the end of the session because she had an ear to ear the entire hour-long session. She really had us grinning from the start as well. That is what I love about smiles, they are so contagious. Like I always say, when momma is smiling, everyone is smiling. It just spreads and spreads. So, if you are planning a last minute fall beach getaway, we feel it imperative that you give us a call and let us help you plan all the details of a great professional family portrait session. We are a husband and wife team, and we're here to tell your family vacation beach story. With over twenty five years combined experience on the beach, we have the skill to make you vision a reality. So, take a deep breath, smile, and dial our number (251) 968-2119 and lets get to planning. The fall is the perfect time for a beach escape, the weather is still tropical around here, and the sand is still sugar white, so what are you waiting for. The beach is calling, and vacation is GOOD.